As we head into the final quarter of 2015, free photo sharing on the Internet is staggeringly ubiquitous, and is something most of us take for granted. Today, most online image sharing is really publishing – making images available (or at least potentially available) to a wide audience, most of whom may not be known to the image creator. But whilst this phenomenon is now deeply entrenched in Web culture, it’s still relatively new. It’s easy to forget that the technology to even capture digital images did not gain great presence in the mainstream until long after the Internet became a recognised resource. It’s also easy to forget that until June 2011, photos could not be uploaded directly to tweets (I know, imagine not having a photo-upload button on a tweet composition box!). And for some of us, it’s getting harder by the week to remember the roots of online photo sharing. When did all this start, and how did it take over our lives? Before the 21st century, there was no real scope for online image sharing on the scale we see today. Technical limitations in the Internet connections of the 1990s meant that even just viewing large numbers of substantial images online was a prohibitive challenge. It’s brilliant whizzing through galleries of pics when everything loads instantly, but try doing it when each image takes half a minute to load, and the fun soon turns to annoyance. And let’s not disregard the cost! The default for consumer Internet services in the ’90s was a metered access model. When you’re literally paying a call charge for that photo to load, is it really so important that you see it? Digital photos were not being produced in great volume either. Comparatively few people were using digital cameras in the 1990s. The early devices were overly expensive, they gave very poor results alongside similarly priced film-based cameras, and some of the serious photographic magazines wouldn’t even mention them. Film remained the media of choice for the great majority of people up to and beyond the dawn of the new century. It was possible to digitise images from film in the ‘90s, but realistically, most people weren’t going to bother. So early on, image sharing remained just that: sharing, with family, friends and other known parties. If you wanted to actually publish images, you built a Web site, using a resource like Microsoft Front Page, and you hosted the image files yourself, either on your own server, or within a hosting package you were paying for. Average Joe/Jane was not going to do that. From the end of the 1990s, however, online photo sharing options did begin to gather a profile. Notables such as Shutterfly and Ofoto went head to head with aggressive promotions before Christmas 1999. But digital photo sharing was still far from a done deal. I worked in photographic retail during the rise of digital capture, and I remember that even in 2000, digital cameras could still be a very difficult sell. 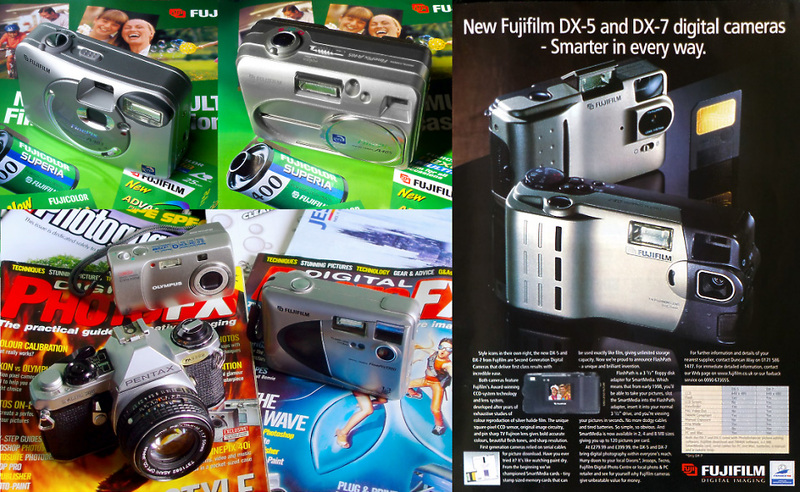 In 1999, the default digital imaging devices were scanners, and scanning images from film or prints was an enthusiast market – not something the masses were ready to adopt. For reference, the photo above was shot on 35mm film and digitised via a home film scanner. Indeed, many of the early sharing businesses exploited scanning as a service. The consumer sent them a film by post, then the business processed the film, scanned it, and charged a small fee for each individual scan the consumer wanted to download. 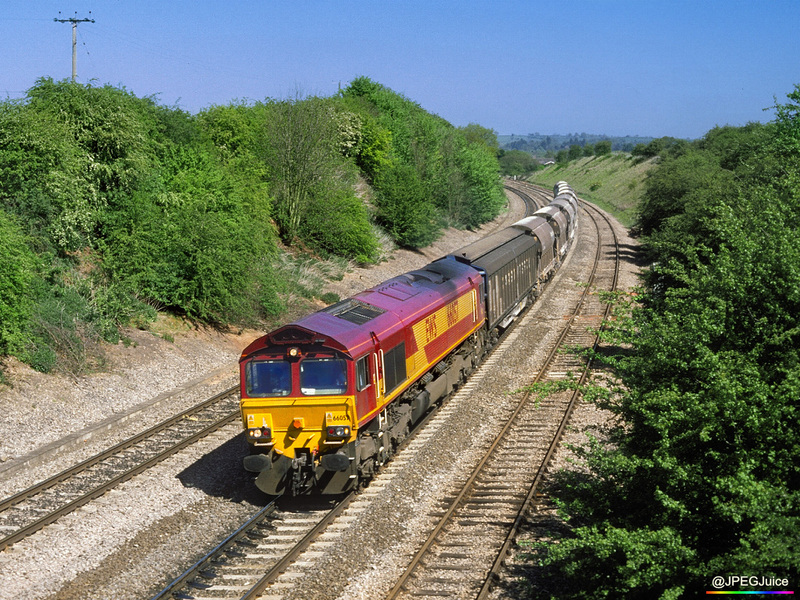 Alternatively, the customer could simply buy a photo CD containing a whole film’s worth of scans. Sales of digital cameras were growing exponentially, but as a proportion of the overall market, digicams were still niche. 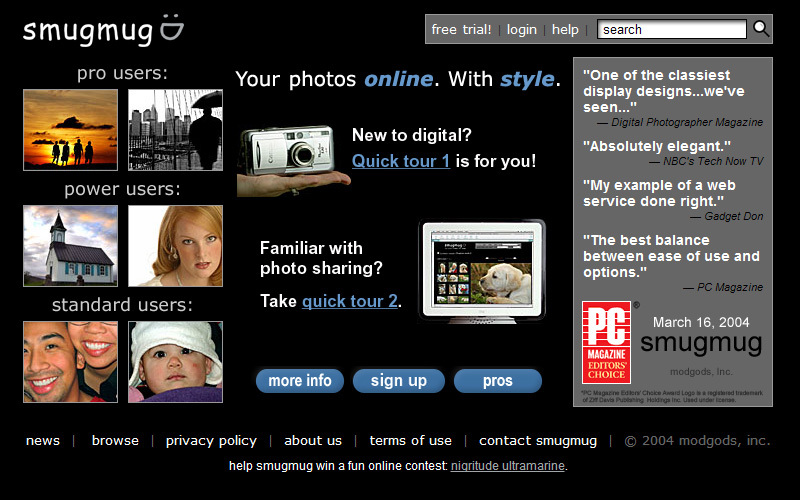 You can see from the above capture of Ofoto’s homepage as it was around the turn of the century, that these early online photo sharing businesses were really morphing out of traditional D&P (developing and printing) services, and the shareables, whilst created via the Internet, were largely being passed back into the offline domain. Snapfish was another D&P-plus-sharing-and-storage biggie from around the turn of the century, although it came very shortly after Ofoto and Shutterfly. Dealing in ‘hard’ shareables made sense commercially. The early photo sharing businesses had to monetise with a fairly low economy of scale, and that meant charging users directly rather than simply serving third-party ads to a very high-volume audience. The sale of prints and printed merchandise sat centre-stage, as the core service. The rest of the offerings were really there as a means to push a glorified D&P trade. The businesses would offer giveaways, but the free offers were certainly not unlimited. Some of the early players were accused of heavy email spam and hard selling too, so freebies were not always as ‘no-strings’ as they sounded. The providers might also offer online storage as part of their service, but if free, it would typically be limited access storage – visible only to registered users, and with viewing only at low resolution. Free hotlinking to message boards and the like would be pretty much untenable at this stage. Sites that did try to offer hugely attractive sharing options for free were at high risk of collapse. A large number of sites either shut down or ceased offering free services in the early noughties. So users of image storage facilities were at the mercy of fate, and many uploads were best considered temporary. Today, if you upload an image to WordPress, you don’t doubt it’ll still be there next year, but at the start of the century that kind of assurance didn’t exist. Those early sites could be gone in a few months’ time, and indeed, many of them would deliberately delete photos to regain space after relatively short periods of user-inactivity. The upload systems were sometimes distributed on CDs, placing photo management and enhancement software on the user’s hard drive, and then simply hyperlinking to an online store. It made much more sense to have the user-interface and functional software loaded at the user’s end (on the actual PC) rather than on a website, as it drastically cut down on the amount of data transfer required. The Jessops Print@Net CD installed Pixology – a user interface that enabled consumers to select and edit photos from their computers, then upload them and directly place orders for prints, mugs, T-shirts, etc. Pixology’s proprietary image management software (Piccolo – as seen in the post-header photo) drove the browse-and-select process, and was particularly useful on older Windows systems, which could not inherently display image thumbnails. Whilst this incarnation of the system came from early 2001, the software itself pre-dated the market entry of Shutterfly, Ofoto, and Snapfish. 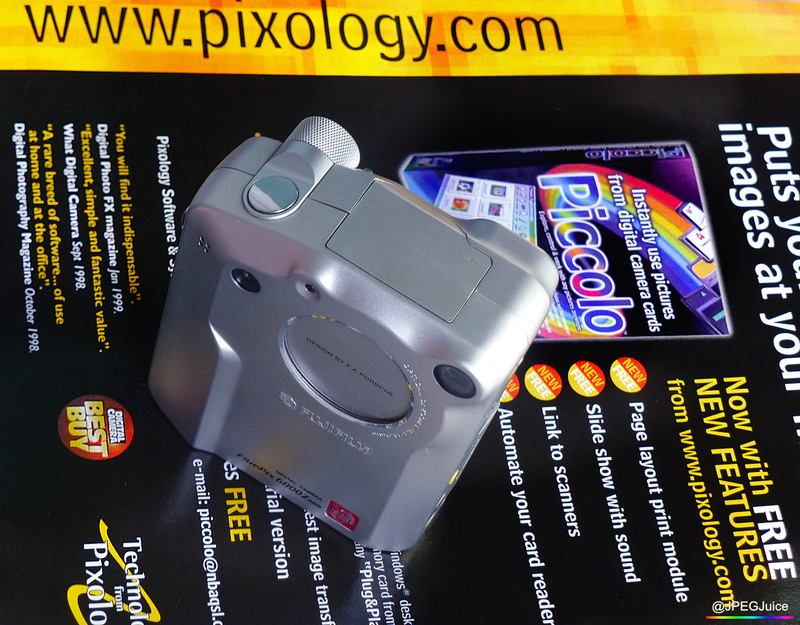 1990s image management systems like Piccolo were in many ways the roots of online photo sharing. To corner the mass market, organisation had to be graphical and easy, and these old management systems developed an appropriate environment. 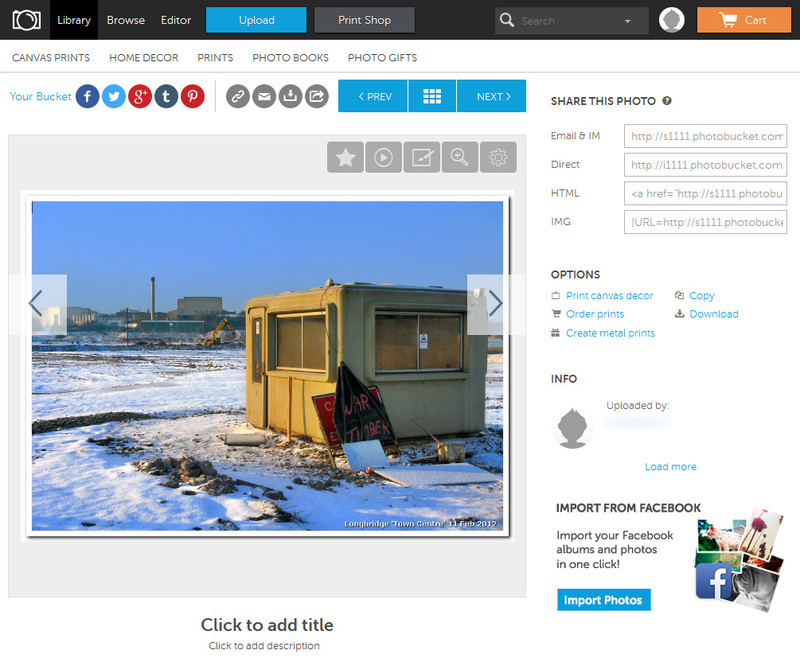 Picasa – similar in basic principle to the Pixology system, was developed later in 2001, with advanced search features. Picasa subsequently incorporated an instant photo messaging system called Hello, which helped give the package award-winning status. In spring 2004, Picasa teamed up with the Google-owned web-logging platform Blogger to facilitate the display of images on blogs. Very shortly afterwards, Picasa itself was absorbed into Google, at which point the product’s $29 purchase fee was dropped, and it became free. Picasa perfectly illustrates how a ‘90s concept like Piccolo ended up driving the rise of widespread electronic photo sharing. 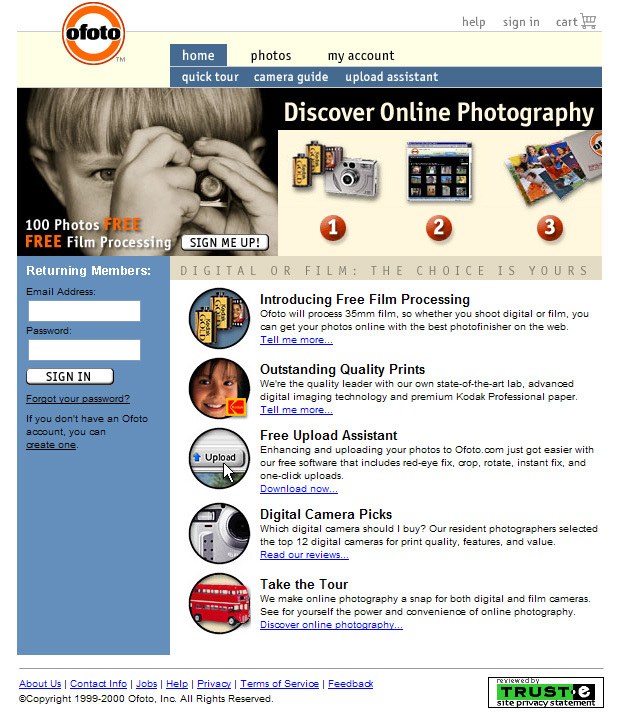 By 2002, there was a market for a high quality online hosting and sharing resource for serious photographers. Digital cameras were now shaking off their reputation for poor quality, and well-featured, 5 megapixel enthusiast cameras were easily falling into the sub-£1,000 price bracket. The old guard’s negative commentary on digital cameras was evaporating, and film-diehards were adopting digital capture in growing number. The new hosting and sharing site smugmug epitomised what serious photographers were looking for in a web resource. It was subscription-only, but in 2002 and 2003, there was no way any photographer would find this kind of quality and a sensible strategy for longevity without paying for it. Remember Alex Welch? He who was running Picturefuse in 2001? Well, it was now time for him to step out of the shadows and into the big league, with a new project called Photobucket. Photobucket was a landmark in photo sharing, offering its service free of charge, with a cap on usage, and funded by donations. Taking up its domain in June 2003, not only was Photobucket free – it also, critically, offered a very simple to use hotlinking facility. At the time, hotlinking was almost a dirty word, and an affront to many photo site owners, as it used up their potentially expensive bandwidth without providing them with any obvious return. Hotlinking was and is a means of posting an image hosted on one server, to a site hosted on another. It would typically be used to display images on forums and other sites which did not have their own inherent means of uploading photos. The user would upload to the host site (Photobucket), then grab a block of code from the host site, paste the code into a post on their intended display site (a forum, auction site or similar), and the photo would magically appear where desired. Demand for hotlinking was big and increasing. A lot of people had been doing it on the sneak, with all the pitfalls that entailed, so to find a provider offering it legitimately as a free service was a pretty major talking point. What hotlinking lost the host in bandwidth costs, it made up for in attention and viral spread of the business’s name. Free hotlinking was a very good way to get an image host noticed. Whilst Photobucket later became (in my opinion) pretty excruciating with its highly intrusive advertising, heavy-handed tracking and insistence on thrusting unwanted crap into the user’s face, in its original form and under its original owner Alex Welch, the site was almost too good to be true. By late 2003, Photobucket was the forehead of a game-changing wave of sharing utilities, which were circumventing paid hosting, and allowing the photographer to publish her/his work across a wide range of platforms, for free. Through the mid noughties, Photobucket and its temp-hosting sibling Tinypic accounted for the lion’s share of image hotlinking across the Internet. 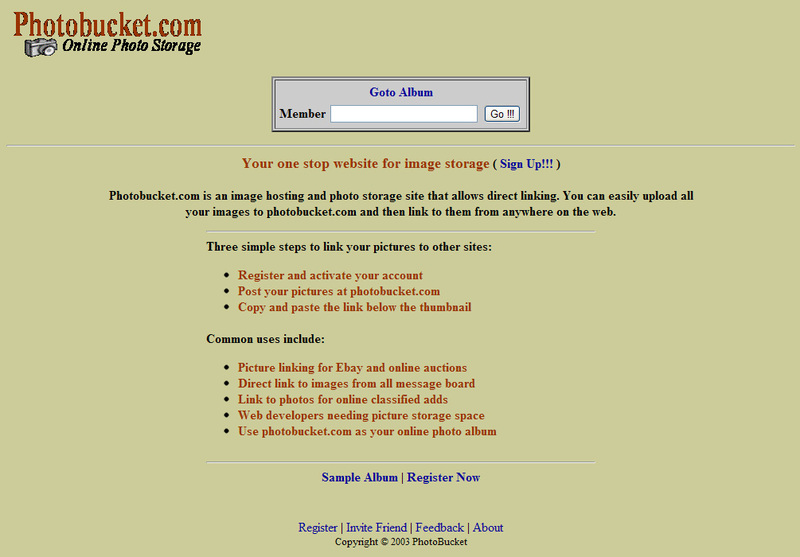 Notably, Photobucket was very frequently used even when the display sites (MySpace, for example) had their own, built-in image upload facilities. Photobucket initially had a maximum file upload size of just 250 kilobytes, but today, file sizes are unlimited, and only the total storage capacity is capped. At the time of writing, free users get 10GB of storage, but will still see annoying low quality adverts. Users can pay to remove ads, but even with ads removed the site still doesn’t set the world alight. It remains best used as a hotlinking resource rather than a means of image display, but hotlinking is nothing like as big a deal as it was. The forums and platforms which made hotlinking so desirable in the first place are themselves now taking a back seat to newer sites that do not require third-party image hosting.